As with Dürer's rhinoceros, historians know exactly which specific animal inspired the character of the dodo in Alice in Wonderland. The species, Raphus cucullatus, had long since gone extinct, but one of the last of the birds – and the only documented specimen to have been brought alive from its native Mauritius to Europe – died after display in London and its remains were added to a cabinet of curiosity prior to 1656. From there the specimen passed to the Ashmolean Museum in Oxford, but was incinerated either accidentally in a fire or deliberately due to disrepair. When the collections of the Ashmolean were transferred to the newly built Oxford University Museum of Natural History in 1860, all that remained of the bird were the skull and a few bones. These remnants (IMAGE ABOVE) were seen by British author Charles Lutwidge Dodgson (1832-1898), better known by his pen name Lewis Carroll, and are now kept under lock and key by the collections manager. 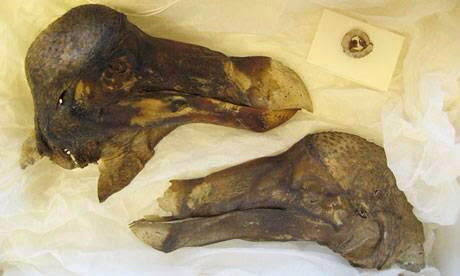 Author Henry Nicholls was given a rare glimpse of the Oxford dodo recently and writes, "[Malgosia] Novak-Kemp lifts the lid and there in the shoe-box-like container, nestled on a bed of tissue paper, are the grizzled remains of a remarkable old bird, a specimen whose story can be traced back to the early 17th century."